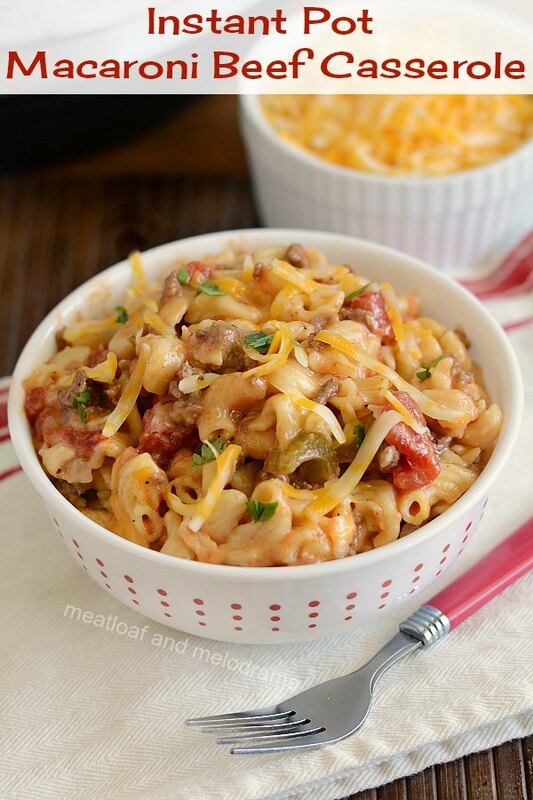 Instant Pot Macaroni Beef Casserole is a quick and easy dinner made with ground beef, pasta and diced tomatoes in the pressure cooker. 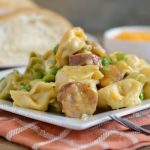 This simple, budget friendly meal is perfect for busy days, and even picky eaters love it! 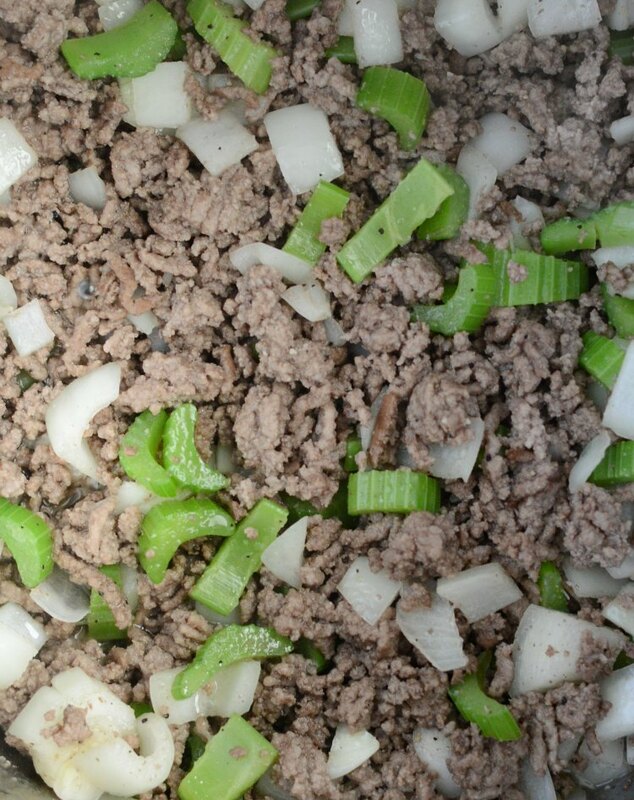 This easy Instant Pot ground beef recipe is based upon one of the Hubs’ favorite dinners that his mom made when he was growing up. 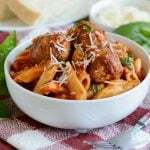 It’s similar to American goulash, and it’s super easy. 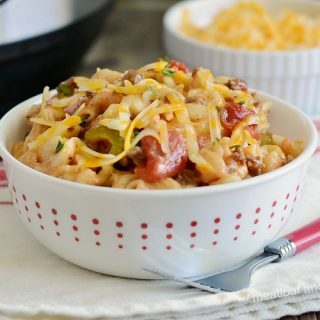 If you’re looking for a simple budget friendly dinner, you’ll love this Instant Pot macaroni beef casserole! I’m always looking for easy ground beef recipes, so when the Hubs talked about this hamburger casserole recipe, I wanted to try it. It was Mother’s Day weekend, and we were both feeling a tad nostalgic, so we got to talking about some of our favorite childhood recipes. 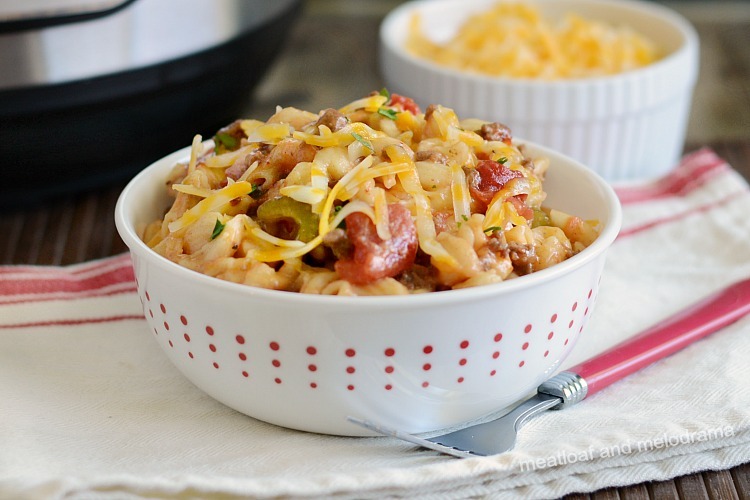 When the Hubs mentioned this macaroni casserole, I thought it sounded a lot like American goulash, only his family didn’t call it that. The original recipe was cooked first in a skillet and then covered with cheese and baked in the oven. While that sounds like wonderful comfort food, it’s a tad warm for the oven right now, so I decided to make a pressure cooker version of the same recipe. You guys, the Hubs gave this pressure cooker ground beef dinner a double thumbs up. He said it tasted exactly like he remembered, and even my picky eaters liked it. Score another win for mom! This recipe starts out like my other Instant Pot ground beef recipes. You brown the ground beef directly in the inner pot, and then you start adding the other ingredients. like I said, this Instant Pot recipe is super simple, so you just throw in some sea salt, garlic powder and pepper. Then, you add chopped celery and onions. Next, you layer macaroni, water and diced tomatoes. The tomatoes go on top, but don’t stir them into the rest of the ingredients. Pressure cook everything together for a couple of minutes, add some shredded cheese, and that’s it! I was so tempted to add a little extra spice, but as it turns out, you don’t need it. 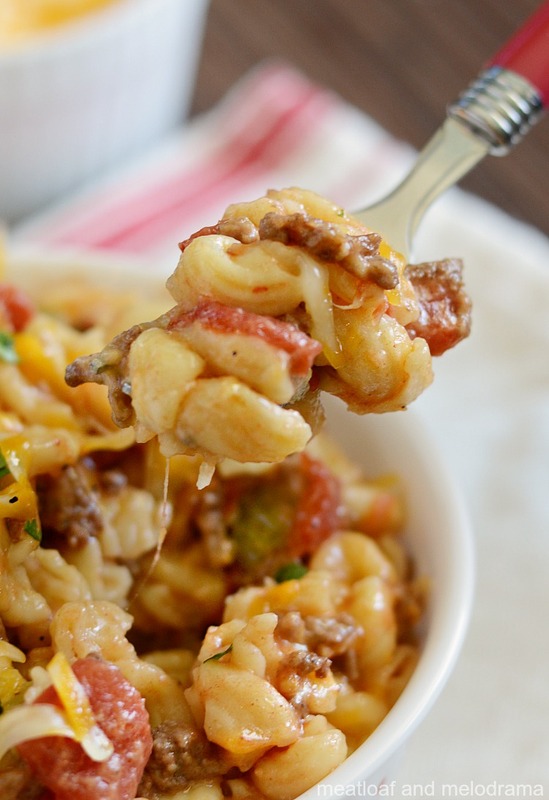 This simple ground beef and pasta dinner is tasty enough as it is! The pasta gets pretty soft, but my kiddos like it that way. So does the Hubs. If you want firmer pasta, you might try cooking it for only 3 minutes. Do you have to brown the ground beef first? Since the pasta cooks faster than the beef, I recommend browning the beef on the saute setting before adding the rest of the ingredients. 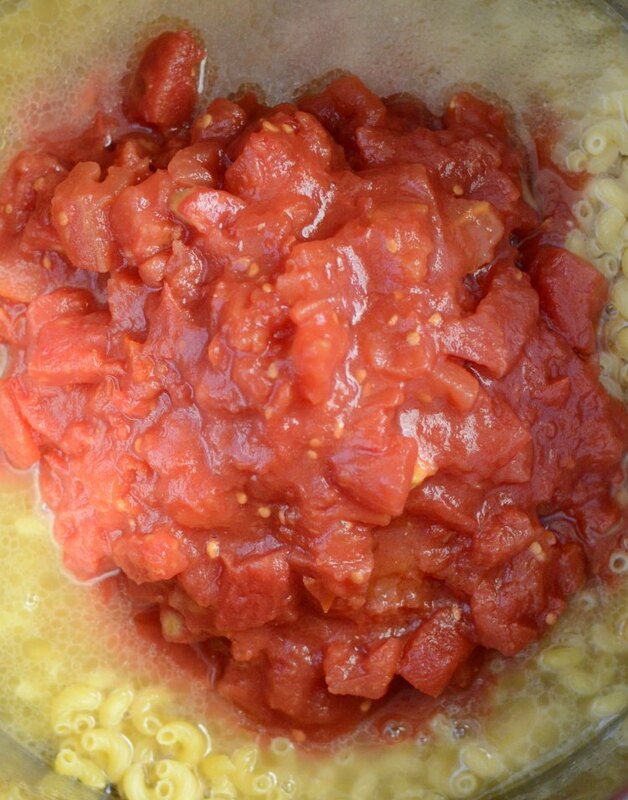 Hit CANCEL, then add macaroni, water and diced tomatoes. Do not stir. Cover with lid, and turn vent to sealing position. Hit PRESSURE COOK for 4 minutes, and do a quick release. Will be making this for the family tomorrow, this looks so tasty! Awesome! I hope your family likes it! Yum, this looks so delicious! My family would love this! Lovely beef casserole …Nice presentation! Looks really good! So I have a tomato allergy … do you think making this without them would be ok? Would I need to add more liquid as a result of omitting them? It’s so hard finding recipes that don’t require to form of tomatoes -> paste, powder, etc ! I love IP pasta for busy weeknights! This looks so tasty! 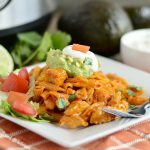 This looks like a great weeknight meal my family will love! What a great dish! Seeing your pix make me want to dig right in! Love how the IP makes everything so easy! 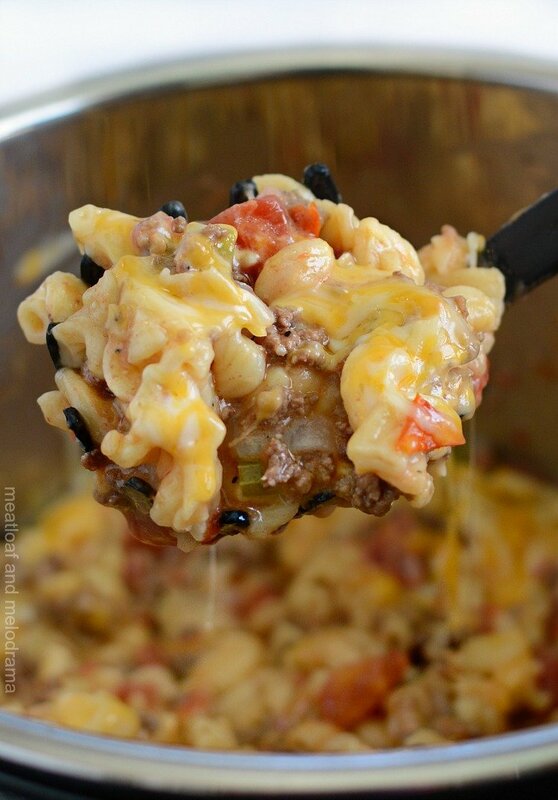 What a great Macaroni Beef Casserole, we will love it! Hope you are having a great week and thanks so much for sharing with us at Full Plate Thursday and come back to see us real soon! Made for dinner just now,too hot for oven and stove,hubby loved it! Its a keeper and so quick! I haven’t tried it, but I know people who pressure cook the frozen meat on the trivet for 15 to 20 minutes and then cook the rest of the recipe after that. The beef broth probably makes it taste even better. Thanks, Alex!